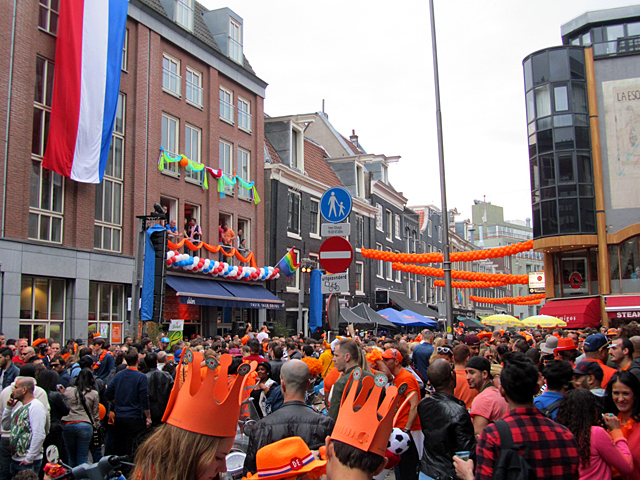 One of the highlights in Reguliersdwarsstraat are the street parties to celebrate King's Day on April 27, previously known as Queen's Day. 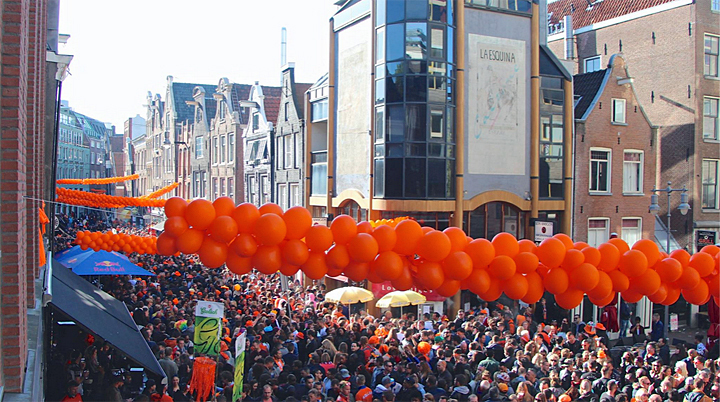 King's Day is the celebration of the birthday of the Dutch king Willem-Alexander. In Amsterdam, this event attracts hundreds of thousands to the city centre. The distinctive color of this day is orange, as that is also the family name of the royal family. On King's Day, restaurants and fastfood places are allowed to sell their food out on the street. 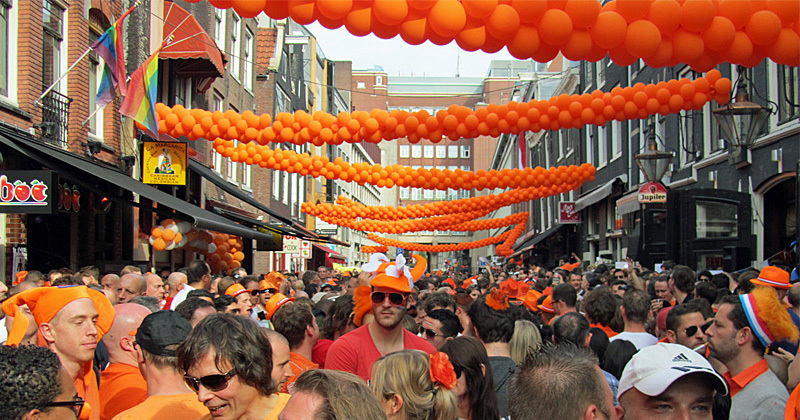 Please note: on King's Day, you are not allowed to have more than one alcoholic beverage in your possession at a time. Outside the famous gay venues in the western part of the street there's an open and freely accessible street party with 12-meter long bar, music, live acts and exciting surprises! - 18.00 - 19.00: The biggest Happy Hour of the city! - DJ line-up: 17.00: DJ Q (Curacao), 19.00: Joshua Walter, 20.00: Lim de la Cruz, 21.00: DJ Cor, 22.00: Morinho, 23.00: Rob Boskamp. Live performances: Sonya The Disco Diva, Irma Derby and Miss Bunty. - DJ line-up: 12.00: DJ Q (Curacao), 13.15: Sergio Tee, 14.30: Clark Kent, 16.00: Mister NiceKai, 17.45: Rob Boskamp & MC 11. After the end of the celebration outside, the party continues inside the various places! On both days, the party continues inside until late! 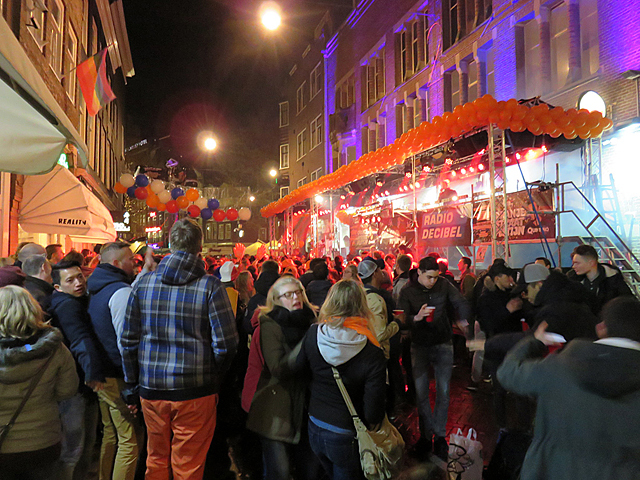 The Dutch street party organized by Jantjes Verjaardag in the eastern part of Reguliersdwarsstraat attracts a mainly straight audience. In the western part of the street, there's traditionally a large crowd of gay people, but this street party also attracts an increasing number of straight people. Click here for an overview of YouTube videos showing how King's Day and Queen's Day were celebrated in earlier years!